One of China's most prominent human rights activists, Hu Jia, has been awarded the European Parliament's Sakharov Prize for Freedom of Thought. Mr Hu, a democracy, environment and Aids activist, is serving a jail term for inciting subversion of state power. The European Parliament in Strasbourg left a symbolic empty chair and gave a standing ovation in his honour after an acceptance speech made by his wife. Beijing has criticised the award as an interference in its internal affairs. Mr Hu's wife Zeng Jinyan thanked MEPs for the recognition in a video message while under house arrest in Beijing. Ms Zeng told the parliament Mr Hu had hoped to be China's last prisoner of conscience but said that more dissidents had been arrested since his detention. "The situation of freedom of opinion is still absolutely appalling and there is no reason for optimism," she said. Ms Zeng said she had been forbidden by prison guards to discuss the prize when she last visited her husband. "We were both warned... that we were forbidden to talk about the fact that he had been awarded the Sakharov Prize," she said. Ms Zeng said her husband was in poor health but he continued to fight for human rights. At the awards ceremony, Hans-Gert Pottering, President of the European Parliament said Mr Hu "was nominated as the representative of the silenced voices of China and Tibet, but today we will hear that voice". "In 1988, one of our first prize winners, Nelson Mandela, was in jail. In 1988, there was also an empty chair for Andrei Sakharov; here today, there is an empty chair for Hu Jia," he added. Mr Pottering said Europe wanted good relations with China but could not ignore human rights. Mr Hu is credited with chronicling instances of abuse and alerting both fellow Chinese human rights activists and foreign news organisations. He was convicted last April of inciting subversion, and is now serving a three-and-a-half-year jail sentence. China, which views Mr Hu as a criminal, reacted angrily to news of the prize when it was announced in October, saying it was "a gross interference in China's domestic affairs". Earlier in December, relations between the EU and China soured when China called off an EU-China summit over a plan by French President Nicolas Sarkozy to meet the Dalai Lama - a meeting that went ahead. 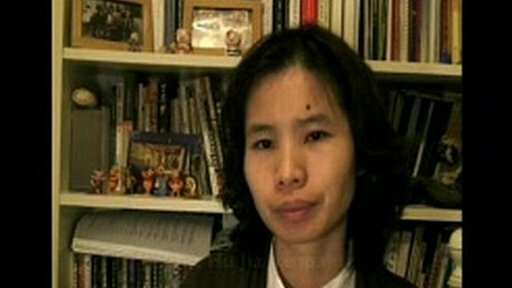 Ms Zeng said she planned to use the 50,000 euros ($64,000; £39,500) prize money to set up a foundation to support families of activists, who were often harassed by the authorities. Human Rights Watch said China should provide appropriate care to manage Mr Hu's liver cirrhosis, which is related to his chronic hepatitis B. The annual EU prize is named after Soviet rights activist and dissident Andrei Sakharov. The Sakharov Prize for Freedom of Thought has been awarded annually since 1988 to "individuals or organisations who have made an important contribution to the fight for human rights or democracy". Last year, it was given to Sudanese human rights lawyer Salih Mahmoud Osman and previous winners include Myanmar opposition leader Aung San Suu Kyi.